- Fly Wheel: 11kgs, 3 pcs Crank. - Meter: SR8260-7, 2 Color LCD/ Back Light. - Display Scan, Speed, Time, Distance, Calories, Pulse, Recovery, RPM, Manual Watt, H.R.C., User Profiles, 12 Programs, Cap Switch. • Dimension : 54 (L) X 24 (W) X 58 (H). 12 kg outer magnetic wheel. Manual 8-level resistance adjustable system. Computer main function: Speed, Distance, Handle Pulse, Time, Calorie, Scan, Body Fat, BMI, BMR. Designed for Home use.Electronic Meter displays time, distance, calories burned, speed and scan. Ergonomic adjustable-reach arms with padded grips. Our clients can avail premium quality of Upright Bike from us. 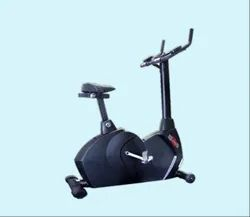 These Upright Bikes are sturdily constructed and are beneficial for keeping a person physically fit and fine. 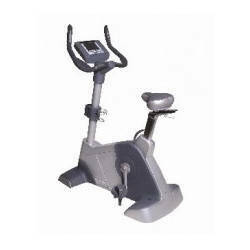 The Upright Bikes are ensure long lasing service and are give optimum level of performance. We offer these Upright Bikes at most affordable prices to our precious customers.